We want our guests to feel at home while visiting the Inn. They are welcome to use and enjoy our gathering rooms and outdoor gathering spaces. 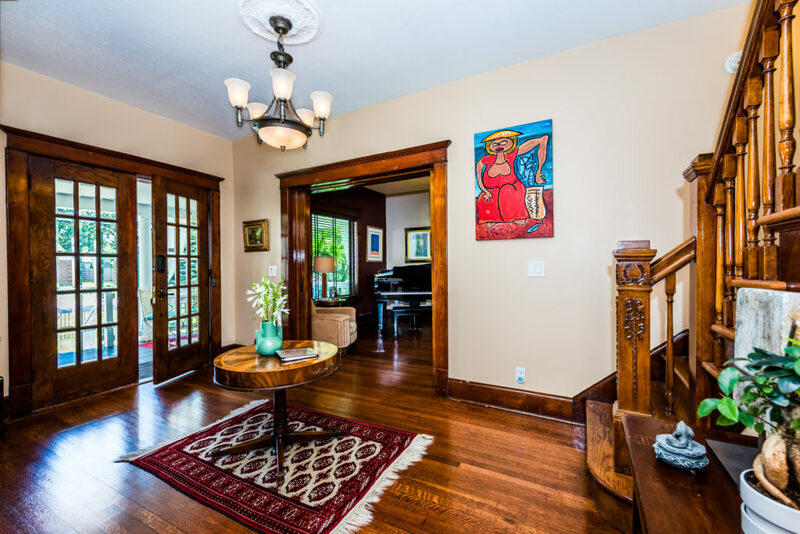 From the entry foyer, you will have easy access to our formal parlor, library, dining room, butler’s pantry/beverage center and stairs up to the guest suites. Formal Parlor with original inlaid floors, Aldine fireplace, timeless electric furnishings and appointments. The parlor at Three Oaks Inn is furnished with timeless yet comfortable furnishings from a mix of period styles. 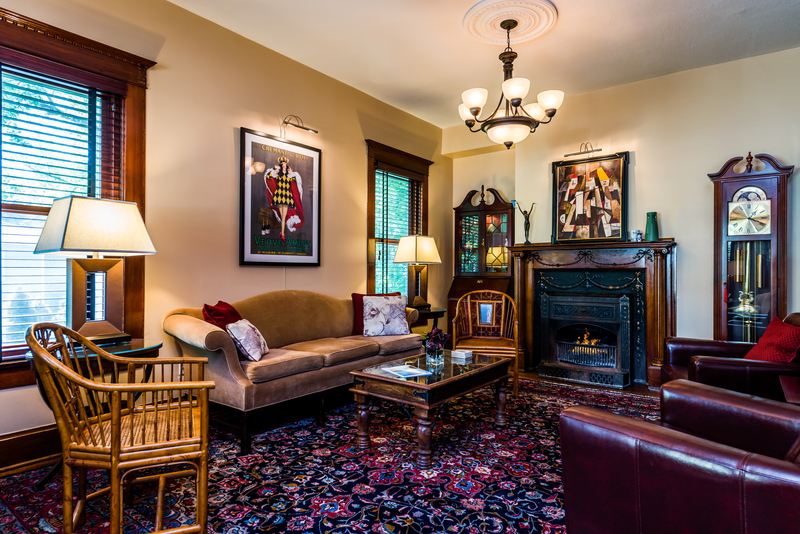 Guests of the Inn are welcome to use the parlor for watching television, reading, relaxing, meeting their guests, or enjoying a glass of wine. During the cooler months, we may light the fireplace for you to enjoy time spent by the hearth. 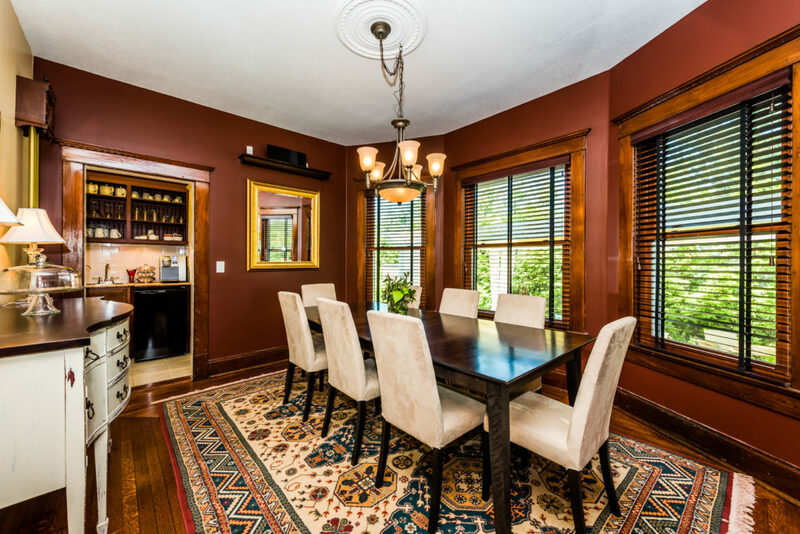 The original mantel, wood trim, French Pocket doors with cut beveled glass and wood floors add to the character and detail of this comfortable space. 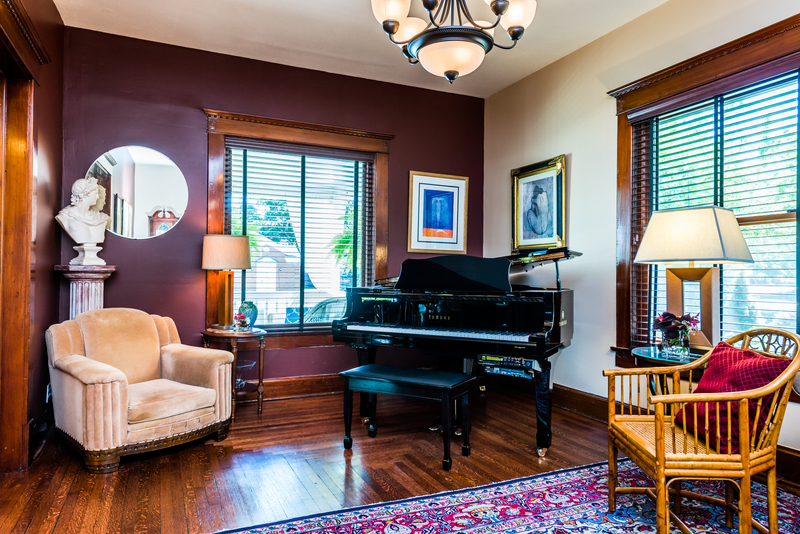 Well appointed parlor with full-size grand piano, original artworks, hand-knotted rug and comfortable furnishings. Our guests are welcome to play the grand piano at their leisure after breakfast time though the early evening hours. During the holiday season, you might be part of an impromptu Christmas Carol or Holiday melody. Cozy library that can be converted into a private sleeping room for two guests. The Library is located just across the entry foyer from our formal parlor, just behind the original French doors with cut beveled glass. 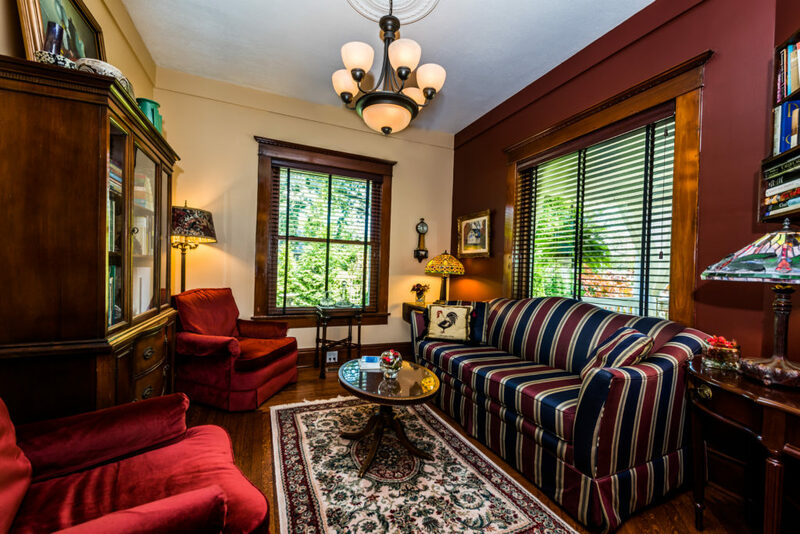 It offers a cozy space for you to relax and read a book, newspaper or magazine. Should the entire Inn be rented by a single party, this room may become a sleeping room for up to 2 adults with a queen sofa-bed and is available only when a single-party rents the entire Inn. Please see our Room Reservation page for details and room rates. Our house-prepared signature hot-entree breakfast is served each morning in the dining room. Every morning you’ll enjoy our signature hot-entree breakfast featuring our house-made fritatta or quiche souffle, smoked breakfast ham or maple sausage links, just-from-the-oven baked goods, fresh-fruit compote and fresh juice. You’ll find complimentary hot and cold beverages offered anytime from our self-serve beverage station located adjacent to the dining room. Feel free to store your perishables or brought-in beverages in the refrigerator as well. Ask us about utilizing our dining room for lunch or dinner should you wish to order-in and dine here. 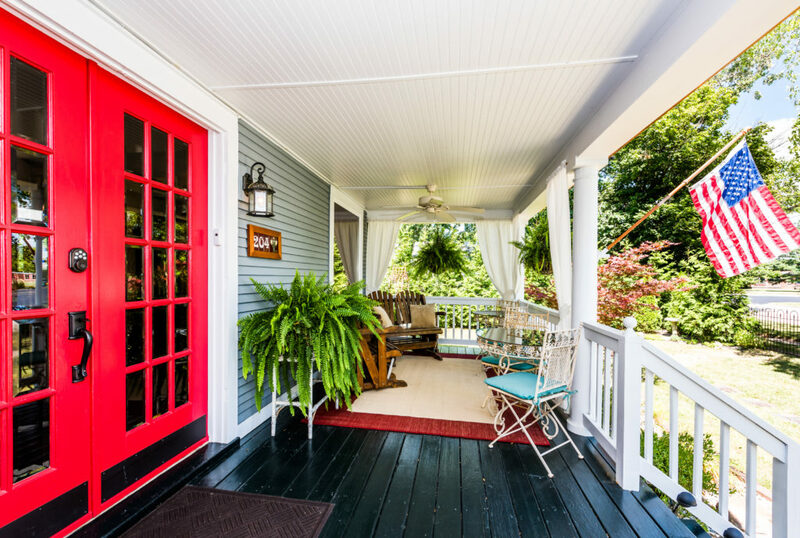 Enjoy time relaxing, dining or entertaining on the expansive front porch. 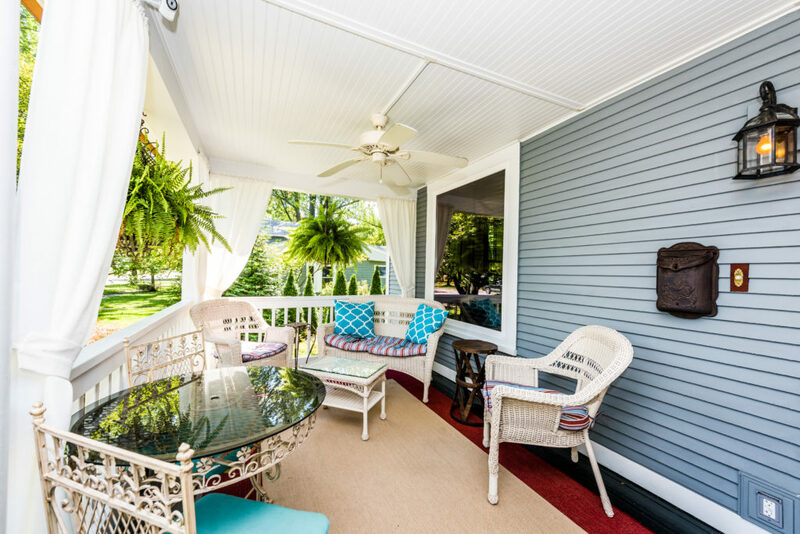 Relax on our covered front porch with a chilled glass of wine during the warm months. We consider our covered front porch and furnished patio under the garden pergola outdoor gathering rooms. Relax and enjoy the breeze on a warm afternoon or evening, sipping iced tea or a glass of chilled wine while reading a book or just letting time go by. Entry to the Garden Pergola and Patio. Covered patio under the Garden Pergola that overlooks the enchanting fountain. 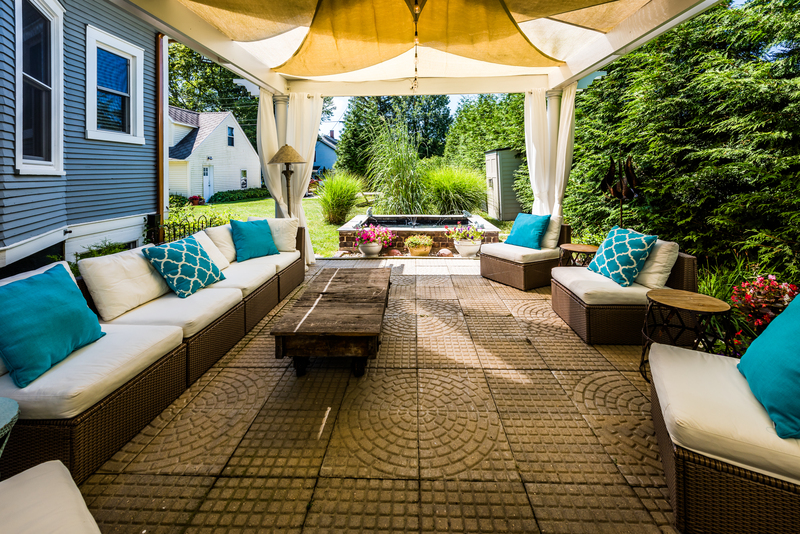 Enjoy time under our garden pergola that’s furnished with a comfortable contemporary modular outdoor sectional sofa. The fountain is the focal point with its verdigre frogs adding to the experience. 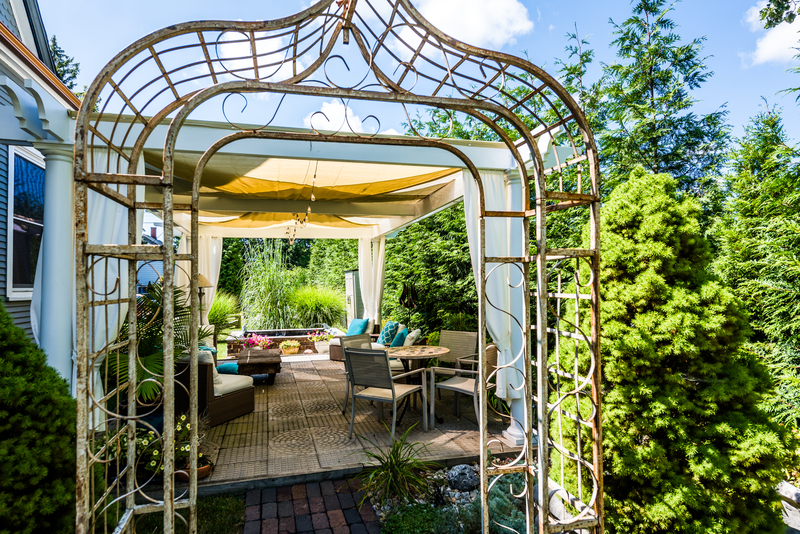 The patio under the pergola easily converts from lounging space to a wonderful dining space for group outdoor dinners. 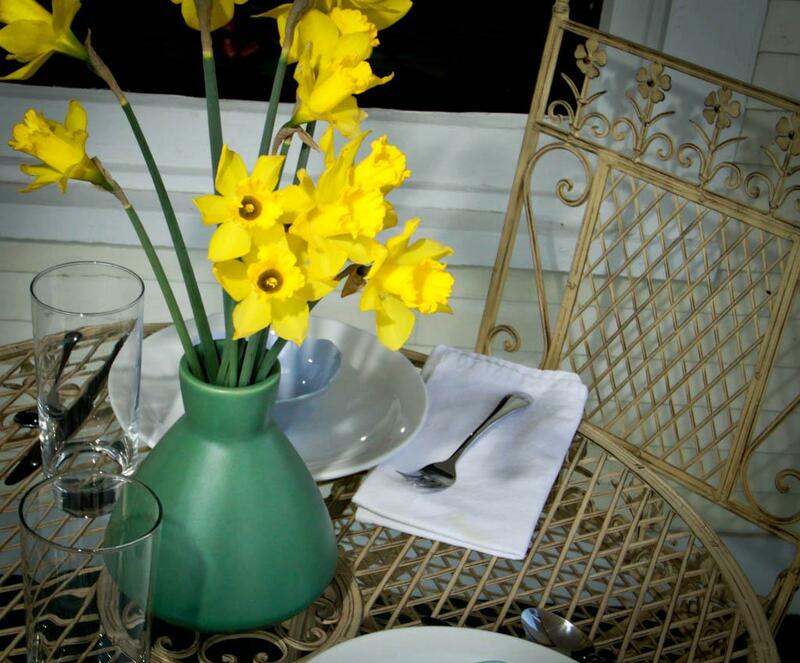 Guests are invited to enjoy their breakfast outside on our covered porch or in the garden on our expansive patio area. While we serve breakfast in the dining room, you are welcome to use one of our bistro tables on the covered porch or under the garden pergola to enjoy our signature hot-entree breakfast alfresco.